In firearms, rifling is the helical groove pattern that is machined into the internal (bore) surface of a gun's barrel, for the purpose of exerting torque and thus imparting a spin to a projectile around its longitudinal axis during shooting. This spin serves to gyroscopically stabilize the projectile by conservation of angular momentum, improving its aerodynamic stability and accuracy over smoothbore designs. Rifling is often described by its twist rate, which indicates the distance the rifling takes to complete one full revolution, such as "1 turn in 10 inches" (1:10 inches), or "1 turn in 254 mm" (1:254 mm). A shorter distance indicates a "faster" twist, meaning that for a given velocity the projectile will be rotating at a higher spin rate. The combination of length, weight and shape of a projectile determines the twist rate needed to stabilize it – barrels intended for short, large-diameter projectiles like spherical lead balls require a very low twist rate, such as 1 turn in 48 inches (122 cm). Barrels intended for long, small-diameter bullets, such as the ultra-low-drag, 80-grain 0.223 inch bullets (5.2 g, 5.56 mm), use twist rates of 1 turn in 8 inches (20 cm) or faster. In some cases, rifling will have twist rates that increase down the length of the barrel, called a gain twist or progressive twist; a twist rate that decreases from breech to muzzle is undesirable, since it cannot reliably stabilize the bullet as it travels down the bore. Extremely long projectiles such as flechettes may require high twist rates; these projectiles must be inherently stable, and are often fired from a smoothbore barrel. Muskets were smoothbore, large caliber weapons using ball-shaped ammunition fired at relatively low velocity. Due to the high cost and great difficulty of precision manufacturing, and the need to load readily and speedily from the muzzle, musket balls were generally a loose fit in the barrels. Consequently, on firing the balls would often bounce off the sides of the barrel when fired and the final destination after leaving the muzzle was less predictable. This was countered when accuracy was more important, for example when hunting, by using a tighter combination of a closer to bore sized ball and a patch. The accuracy was improved, but still not reliable for precision shooting over long distances. Barrel rifling was invented in Augsburg, Germany in 1498. In 1520 August Kotter, an armourer of Nuremberg, Germany improved upon this work. Though true rifling dates from the mid-16th century, it did not become commonplace until the nineteenth century. The concept of stabilizing the flight of a projectile by spinning it was known in the days of bows and arrows, but early firearms using black powder had difficulty with rifling because of the fouling left behind by the combustion of the powder. The most successful weapons using rifling with black powder were breech loaders such as the Queen Anne pistol. Conventional rifling (left) and polygonal rifling (right). 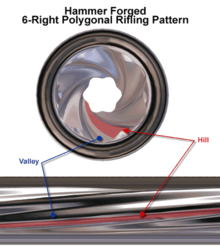 Both types of rifling use a spiraling pattern. The spiraling pattern (here with polygonal rifling) is shown. The grooves most commonly used in modern rifling have fairly sharp edges. More recently, polygonal rifling, a throwback to the earliest types of rifling, has become popular, especially in handguns. Polygonal barrels tend to have longer service lives because the reduction of the sharp edges of the land (the grooves are the spaces that are cut out, and the resulting ridges are called lands) reduces erosion of the barrel. Supporters of polygonal rifling also claim higher velocities and greater accuracy. Polygonal rifling is currently seen on pistols from CZ, Heckler & Koch, Glock, Tanfoglio, and Kahr Arms, as well as the Desert Eagle. For tanks and artillery pieces, the extended range, full bore concept developed by Gerald Bull for the GC-45 howitzer reverses the normal rifling idea by using a projectile with small fins that ride in the grooves, as opposed to using a projectile with a slightly oversized driving band which is forced into the grooves. Such guns have achieved significant increases in muzzle velocity and range. Examples include the South African G5 and the German PzH 2000. Gain-twist rifling, also called progressive rifling, begins with very little change in the projectile's angular momentum during the first few inches of bullet travel after ignition during the transition from chamber to throat. This enables the bullet to remain essentially undisturbed and trued to the case mouth. After engaging the rifling the bullet is progressively subjected to accelerated angular momentum as burning powder propels it down the barrel. By only gradually increasing the spin rate, torque is spread along a much longer section of barrel, rather than only at the throat where rifling is eroded through repeated rifling engagement. Gain-twist rifling was used as prior to and during the American Civil War (1861–65). Colt Army and Navy revolvers both employed gain-twist rifling. Gain-twist rifling, however, is more difficult to produce than uniform rifling, and therefore is more expensive. The military has used gain-twist rifling in a variety of weapons such as the 6998200000000000000♠20 mm M61 Vulcan Gatling gun used in some current fighter jets and the larger 6998300000000000000♠30 mm GAU-8 Avenger Gatling gun used in the A10 Thunderbolt II close air support jet. In these applications it allows lighter construction of the barrels by decreasing chamber pressures through the use of low initial twist rates but ensuring the projectiles have sufficient stability once they leave the barrel. It is seldom used in commercially available products, though notably on the Smith & Wesson Model 460 (X-treme Velocity Revolver). An early method of introducing rifling to a pre-drilled barrel was to use a cutter mounted on a square-section rod, accurately twisted into a spiral of the desired pitch, mounted in two fixed square-section holes. As the cutter was advanced through the barrel it twisted at a uniform rate governed by the pitch. The first cut was shallow but as repeated cuts were made the cutter points were gradually expanded—the blades were in slots in a wooden dowel which were gradually packed out with slips of paper—until the required depth was obtained. The process was finished off by casting a slug of molten lead into the barrel, withdrawing it and using it with a paste of emery and oil to smooth the bore. The grooves are the spaces that are cut out, and the resulting ridges are called lands. These lands and grooves can vary in number, depth, shape, direction of twist (right or left), and twist rate. The spin imparted by rifling significantly improves the stability of the projectile, improving both range and accuracy. Typically rifling is a constant rate down the barrel, usually measured by the length of travel required to produce a single turn. Occasionally firearms are encountered with a gain twist, where the rate of spin increases from chamber to muzzle. While intentional gain twists are rare, due to manufacturing variance, a slight gain twist is in fact fairly common. Since a reduction in twist rate is very detrimental to accuracy, gunsmiths who are machining a new barrel from a rifled blank will often measure the twist carefully so they may put the faster rate, no matter how minute the difference is, at the muzzle end. A barrel of circular bore cross-section is not capable of imparting a spin to a projectile, so a rifled barrel has a non-circular cross-section. 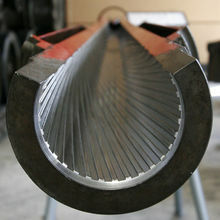 Typically the rifled barrel contains one or more grooves that run down its length, giving it a cross-section resembling an internal gear, though it can also take the shape of a polygon, usually with rounded corners. Since the barrel is not circular in cross-section, it cannot be accurately described with a single diameter. Rifled bores may be described by the bore diameter (the diameter across the lands or high points in the rifling), or by groove diameter (the diameter across the grooves or low points in the rifling). Differences in naming conventions for cartridges can cause confusion; for example, the projectiles of the .303 British are actually slightly larger in diameter than the projectiles of the .308 Winchester, because the ".303" refers to the bore diameter in inches (bullet is .312), while the ".308" refers to the bullet diameter in inches (7.92 mm and 7.82 mm, respectively). It must be sized so that the projectile will swage or obturate upon firing to fill the bore. The diameter should be consistent, and must not increase towards the muzzle. The rifling should be consistent down the length of the bore, without changes in cross-section, such as variations in groove width or spacing. It should be smooth, with no scratches lying perpendicular to the bore, so it does not abrade material from the projectile. The chamber and crown must smoothly transition the projectile into and out of the rifling. Rifling may not begin immediately forward of the chamber. There may be an unrifled throat ahead of the chamber so a cartridge may be chambered without pushing the bullet into the rifling. This reduces the force required to load a cartridge into the chamber, and prevents leaving a bullet stuck in the rifling when an unfired cartridge is removed from the chamber. The specified diameter of the throat may be somewhat greater than groove diameter, and may be enlarged by use if hot powder gas melts the interior barrel surface when the rifle is fired. Freebore is a groove-diameter length of smoothbore barrel without lands forward of the throat. Freebore allows the bullet to transition from static friction to sliding friction and gain linear momentum prior to encountering the resistance of increasing rotational momentum. Freebore may allow more effective use of propellants by reducing the initial pressure peak during the minimum volume phase of internal ballistics before the bullet starts moving down the barrel. Barrels with freebore length exceeding the rifled length have been known by a variety of trade names including paradox. When the projectile is swaged into the rifling, it takes on a mirror image of the rifling, as the lands push into the projectile in a process called engraving. Engraving takes on not only the major features of the bore, such as the lands and grooves, but also minor features, like scratches and tool marks. The relationship between the bore characteristics and the engraving on the projectile are often used in forensic ballistics. 57-N-231 standard 7.62×39mm military bullets with steel core - the one on the left is unfired, the one on the right is fired, with the rifling grooves visible. Notice the copper wash scraped off and the steel jacket is exposed on the groove marks. The original firearms were loaded from the muzzle by forcing a ball from the muzzle to the chamber. Whether using a rifled or smooth bore, a good fit was needed to seal the bore and provide the best possible accuracy from the gun. To ease the force required to load the projectile, these early guns used an undersized ball, and a patch made of cloth, paper, or leather to fill the windage (the gap between the ball and the walls of the bore). The patch provided some degree of sealing, kept the ball seated on the charge of black powder, and kept the ball concentric to the bore. In rifled barrels, the patch also provided a means to transfer the spin from the rifling to the bullet, as the patch is engraved rather than the ball. 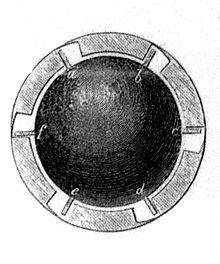 Until the advent of the hollow-base Minié ball, which obturates upon firing to seal the bore and engage the rifling, the patch provided the best means of getting the projectile to engage the rifling. In breech-loading firearms, the task of seating the projectile into the rifling is handled by the throat of the chamber. Next is the freebore, which is the portion of the throat down which the projectile travels before the rifling starts. The last section of the throat is the throat angle, where the throat transitions into the rifled barrel. The throat is usually sized slightly larger than the projectile, so the loaded cartridge can be inserted and removed easily, but the throat should be as close as practical to the groove diameter of the barrel. Upon firing, the projectile expands under the pressure from the chamber, and obturates to fit the throat. The bullet then travels down the throat and engages the rifling, where it is engraved, and begins to spin. Engraving the projectile requires a significant amount of force, and in some firearms there is a significant amount of freebore, which helps keep chamber pressures low by allowing the propellant gases to expand before being required to engrave the projectile. Minimizing freebore improves accuracy by decreasing the chance that a projectile will distort before entering the rifling. For best performance, the barrel should have a twist rate sufficient to spin stabilize any bullet that it would reasonably be expected to fire, but not significantly more. Large diameter bullets provide more stability, as the larger radius provides more gyroscopic inertia, while long bullets are harder to stabilize, as they tend to be very backheavy and the aerodynamic pressures have a longer arm ("lever") to act on. The slowest twist rates are found in muzzleloading firearms meant to fire a round ball; these will have twist rates as low as 1 in 72 inches (180 cm), or slightly longer, although for a typical multi-purpose muzzleloader rifle, a twist rate of 1 in 48 inches (120 cm) is very common. The M16A2 rifle, which is designed to fire the 5.56×45mm NATO SS109 ball and L110 tracer bullets, has a 1 in 7-inch (18 cm) or 32 calibers twist. Civilian AR-15 rifles are commonly found with 1 in 12 inches (30 cm) or 54.8 calibers for older rifles and 1 in 9 inches (23 cm) or 41.1 calibers for most newer rifles, although some are made with 1 in 7 inches (18 cm) or 32 calibers twist rates, the same as used for the M16 rifle. Rifles, which generally fire longer, smaller diameter bullets, will in general have higher twist rates than handguns, which fire shorter, larger diameter bullets. The, traditionally speaking, most common method expresses the twist rate in terms of the 'travel' (length) required to complete one full projectile revolution in the rifled barrel. This method does not give an easy or straightforward understanding of whether a twist rate is relatively slow or fast when bores of different diameters are compared. The second method describes the 'rifled travel' required to complete one full projectile revolution in calibers or bore diameters. Note that the twist travel L and the bore diameter D must be expressed in a consistent unit of measure, i.e. metric (mm) or imperial (in). The third method simply reports the angle of the grooves relative to the bore axis, measured in degrees. Note that the latter two methods have the inherent advantage of expressing twist rate as a ratio and give an easy understanding if a twist rate is relatively slow or fast even when comparing bores of differing diameters. The original value of C was 150, which yields a twist rate in inches per turn, when given the diameter D and the length L of the bullet in inches. This works to velocities of about 840 m/s (2800 ft/s); above those velocities, a C of 180 should be used. For instance, with a velocity of 600 m/s (2000 ft/s), a diameter of 0.5 inches (13 mm) and a length of 1.5 inches (38 mm), the Greenhill formula would give a value of 25, which means 1 turn in 25 inches (640 mm). Improved formulas for determining stability and twist rates include the Miller Twist Rule and the McGyro program developed by Bill Davis and Robert McCoy. 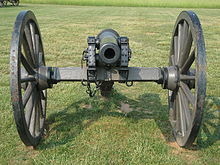 A Parrott rifle, used by both Confederate and Union forces in the American Civil War. If an insufficient twist rate is used, the bullet will begin to yaw and then tumble; this is usually seen as "keyholing", where bullets leave elongated holes in the target as they strike at an angle. Once the bullet starts to yaw, any hope of accuracy is lost, as the bullet will begin to veer off in random directions as it precesses. Conversely, too-high a rate of twist can also cause problems. The excessive twist can cause accelerated barrel wear, and coupled with high velocities also induce a very high spin rate which can cause projectile jacket ruptures causing high velocity spin stabilized projectiles to disintegrate in flight. Projectiles made out of mono metals cannot practically achieve flight and spin velocities such that they disintegrate in flight due to their spin rate. Smokeless powder can produce muzzle velocities of approximately 1,600 m/s (5,200 ft/s) for spin stabilized projectiles and more advanced propellants used in smoothbore tank guns can produce muzzle velocities of approximately 1,800 m/s (5,900 ft/s). 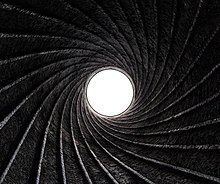 A higher twist than needed can also cause more subtle problems with accuracy: Any inconsistency within the bullet, such as a void that causes an unequal distribution of mass, may be magnified by the spin. Undersized bullets also have problems, as they may not enter the rifling exactly concentric and coaxial to the bore, and excess twist will exacerbate the accuracy problems this causes. A bullet fired from a rifled barrel can spin at over 300,000 rpm (5 kHz), depending on the bullet's muzzle velocity and the barrel's twist rate. refers to the circumference of the circle that this measuring point performs around the axis of rotation. For example, an M4 Carbine with a twist rate of 1 in 7 inches (177.8 mm) and a muzzle velocity of 3,050 feet per second (930 m/s) will give the bullet a spin of 930 m/s / 0.1778 m = 5.2 kHz (314,000 rpm). Excessive rotational speed can exceed the bullet's designed limits and the resulting centrifugal force can cause the bullet to disintegrate radially during flight. ^ Randy D. Smith. "The .54 Caliber Muzzleloader". Chuck Hawks. ^ "Products::Rifle Barrels::Calibers and Twists". Shilen Rifles, Inc.
^ "gain twist". MidwayUSA GunTec Dictionary. Archived from the original on 2009-02-15. Retrieved 2008-08-19. ^ a b Dan Lilja. "What makes a barrel accurate?". Archived from the original on 2007-08-30. ^ W. S. Curtis. "Long Range Shooting: A Historical Perspective". Archived from the original on 2007-06-22. ; Petzal, David E., and Bourjaily, Phil, with Fenson, Brad. The Total Gun Manual (Canadian edition) (San Francisco: WeldonOwen, 2014), p.5. ^ Wilkinson, Henry (1840). Engines of War, Or, Historical and Experimental Observations on Ancient and Modern Warlike Machines and Implements. London: Longman. pp. 108–110. OCLC 254626119. ^ "Internal Ballistics". Hornady. Retrieved 21 June 2018. ^ Holland & Holland. "Definition of a Paradox Gun". Classic Shooting Company. Retrieved 21 June 2018. ^ Daniel Lilja. "Thoughts on Throats for the 50 BMG". Archived from the original on 2008-05-13. Retrieved 2008-08-19. ^ R. L. McCoy (April 1986). "McGyro" (TXT). JBM Ballistics (BASIC). Retrieved November 18, 2017. ^ "GS CUSTOM BULLETS - The 22x64 Experiment". ^ "120mm Tank Gun KE Ammunition". Defense Update. 2006-11-22. Archived from the original on 2007-08-05. Retrieved 2007-09-03. ^ "Calculating Bullet RPM". 3 June 2008. Retrieved 4 February 2015. ^ "Twist Rate". 18 August 2012. Archived from the original on May 12, 2013. Retrieved 4 February 2015. Wikimedia Commons has media related to Rifling.